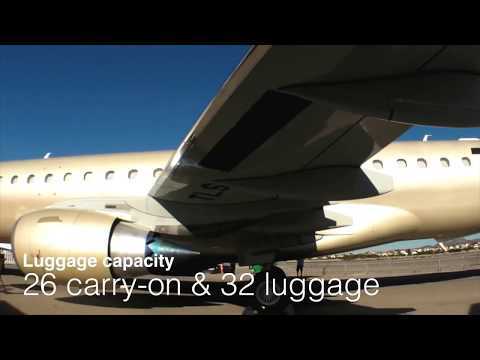 Embraer describe the Lineage 1000 as a "flying apartment" and, with nearly 70 square metres of cabin floor space, it is easy to understand why. The five-zone cabin is longer and narrower than the Airbus' and features 5 separate zones, designed for business, dining, leisure and sleeping, comfortably accommodating up to 19 passengers. Baggage is not a issue as the main compartment offers over 9 cubic metres of space and additional baggage can be stored in exterior lockers with over 3 cubic metres of extra space. The Lineage 1000 is not only extremely spacious but it is also very comfortable as it features top-of-the-range stabilisers and turbulence detection technology to guarantee a smooth flight. In addition to this, the twin turbo engines give this VIP Airliner a range of over 8000km, making it easily capable of trans-continental flight. All things considered, in the Lineage 1000, Embraer have succeeded in creating an aircraft which represents the height of luxury travel in its spacious cabin, while maintaining impressive operational capabilities.